McArthur Court is a basketball arena located on the campus of the University of Oregon in Eugene and the former home of the Oregon Ducks men's and women's basketball teams, replaced in 2011 by Matthew Knight Arena. Also known as "The Pit" or "Mac Court," it was known as one of the most hostile arenas in the nation. The arena is named for Clifton N. (Pat) McArthur, U. S. Congressman and Oregon student-athlete and the school's first student body president. Its unique and antiquated structure has the fans on top of the court. The maple floor bounces under the weight of the student section that surrounds the court. In 2001 Sporting News named it "best gym in America". For its history, character, and atmosphere, sports writer and arena researcher Bill Kintner named McArthur Court in his top five of college basketball arenas in America. He notes that McArthur Court "is a building that will give you chills even if there is no game being played." The arena was funded by a $15 fee imposed by the Associated Students of the University of Oregon and the mortgage papers were burned as part of a public ceremony after the building was completely paid for. Until it was replaced in 2011, it was the second-oldest on-campus arena still in use, after Fordham University's Rose Hill Gym. 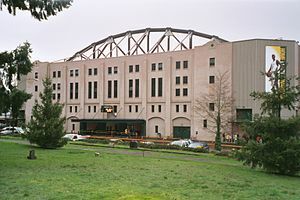 McArthur Court saw its first game on January 14, 1927, a 38–10 Oregon victory over Willamette University. Among its finest moments are two upsets over #1 UCLA in the mid-1970s and another upset of the top-ranked Bruins on January 6, 2007. An undefeated home season in 2001–02 propelled the Ducks to the "Elite Eight" in the NCAA Tournament. Players to call the court home over the years include Ron Lee, Greg Ballard, Blair Rasmussen, Terrell Brandon, Fred Jones, Luke Ridnour, Luke Jackson, Malik Hairston, and Aaron Brooks. Women began playing in 1974 and played their first game at McArthur Court on January 23, 1974 against Southern Oregon University. Mac Court was also home to the OSAA high school 5A and 6A boys' basketball championships from 1971 to 1996 and 2004 to 2009. ^ "Transforming Campus: Basketball Arena". University of Oregon Development: Campaign Oregon. Archived from the original on 2016-10-20. Retrieved 2008-05-24. ^ Hall, Calvin (October 4, 2006). "University seeks use for old bakery site". Oregon Daily Emerald. Archived from the original on 2007-09-26. Retrieved 2007-02-20. ^ "McArthur Court - Architecture of the University of Oregon". University of Oregon Libraries. Retrieved 2007-02-20. ^ Agase, Jeff (December 9, 2002). "Oregon pits visiting teams against McArthur Court". Daily Bruin. Retrieved 2007-02-20. ^ Kintner, Bill (January 18, 2007). "Best College Arena Atmosphere". Collegehoops.net. Archived from the original on January 26, 2007. Retrieved 2007-02-24. ^ "McArthur Court". 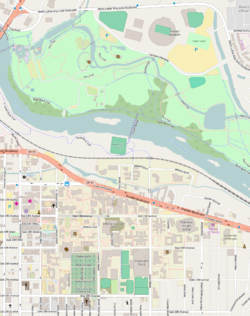 University of Oregon, Official Athletic Site. Archived from the original on 2008-12-12. Retrieved 2007-02-20. ^ Baker, Mark (February 18, 2007). "What counts about The Pit". The Register-Guard. Retrieved 2007-02-20.